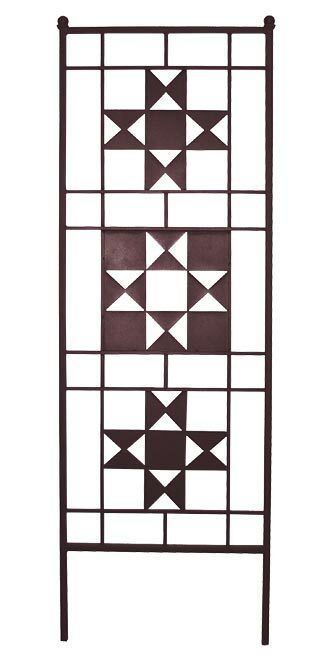 Display your love of quilting and geometric patterns in your yard with these Panacea Rust Rustic Farmhouse Quilt Trellises. These two, tall adornments add wonderful detail to your backyard or garden, their precise angles contrasting the round leaves and blooms of your plants. The robust, square metal frames create a lasting support for climbing plants, and the brown finish of each offsets the green of your crops. The eye-catching center of each unit holds three large, Ohio Star quilt block shapes, secured by both horizontal and vertical metal bars. The metal cutouts on each panel alternate for a fantastic, patchwork look, and two orbs at the top of the frames complete each unit. Stake the legs of each trellis into your soil in moments, for a stable and lovely display. The sturdy, all metal construction makes these both durable and dramatic, while the intricate detailing and deep brown color offer a rugged, pioneer feel. Add charm and height to your backyard or landscaping using these Rust Rustic Farmhouse Quilt Trellises. Note: This case pack includes 2 of the Panacea Rustic Farmhouse Quilt Trellises, Rust, 73"H.